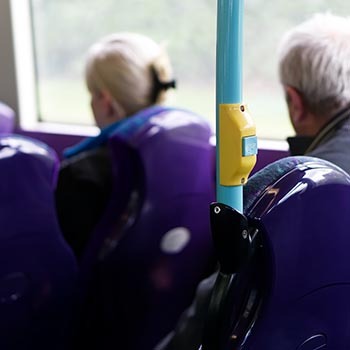 Anchor Hanover, England’s largest provider of care and housing for older people, is urgently calling on the nation to change its poor ‘public transport etiquette’, as new research reveals how a lack of interaction is fuelling a loneliness epidemic among older people. New research, commissioned as part of the ‘Standing Up 4 Sitting Down’ campaign, reveals that passengers on public transport are more likely to look down at their phone or tablet (42%) than look up to see if someone might need a seat (37%). Consequently, more than one in three (36%) older people have recently been unable to find a seat, and not been offered one. Highlighting our reluctance to interact when travelling, forty-three percent (43%) of people admit they’ve not offered up their seat, even if they suspected someone might need it. Sixty-seven percent (67%) of those people failed to do so, despite feeling guilty about it. Furthermore, 14% think they do not need to offer their seat when not sat in a priority seat. With more than three million older people relying on public transport for shopping, socialising and leisure*, turning them away from this vital service with hostile attitudes puts them at a greater risk of isolation. Worryingly, nearly a quarter (24%) of older people feel invisible or isolated, with 24% also reporting physical pain or discomfort from being ignored and left to stand. Consequently, one in five older people (19%) worry so much over a lack of seating, they are less likely to use public transport. The research exposes how manners and a ‘typically British’ stoic attitude are contributing to this breakdown in communication. Despite their discomfort, 41% of older people admit they’re too embarrassed to ask for a seat, while 39% of the public cite ‘fear of causing offence’ as a reason for not offering an older person their seat. Jane Ashcroft CBE, Chief Executive of Anchor Hanover, says: “The implications of people being obsessed with their phones and tablets on public transport, instead of people, is deeply alarming. 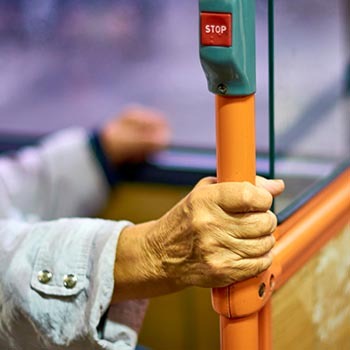 Older people are being left to stand are physically suffering and feeling isolated, leaving them reluctant to use public transport which is a lifeline for so many. “We urgently need to address our lack of interaction by ‘Standing Up 4 Sitting Down’. A small act, such as looking up and offering your seat, can make a real difference. Raymond Burrows, who is 82 and lives at Anchor Hanover’s Penrith Court in Worthing, says: “Public transport is such an important part of my life. It helps me stay independent and, without it, I wouldn’t be able to go into town and do my own shopping. “Though I often struggle to get a seat, I’ve never asked anyone to stand up for me because I’m afraid of how people would respond. I don’t want to bother passengers who are distracted by their phones and tablets, and don’t notice me standing right there. Across Anchor Hanover’s properties, home to more than 60,000 older people, people are writing to their local transport providers asking for them to join the ‘Standing Up 4 Sitting Down’ campaign with posters, stickers and announcements that encourage passengers to consider the needs of others when travelling. *Polling showed 47% of people aged 70+ rely on public transport for shopping, leisure and socialising. The ONS ‘Age Groups’ dataset from 22 August 2018 shows there are 6,548,688 people in England and Wales aged 70 and above. 47% of this population is 3,077,989.